We Do 12 Projects a Year! ¨ Adoption Fest-In collaboration with CPS we invite foster children and prospective adoptive parents to come share a day filled with fun, food and activities. It’s a great way for them to get to know each other in a family friendly environment. ¨ Greeting Cards to Military Service Personnel-We sit around a big table, share stories and write personal notes to members of our military to express holiday greetings and gratitude. ¨ Dignity Bags for the Homeless-Twice a year, we collect items that are often not available to the homeless; things that provide for personal hygiene and provide some dignity to those living without many of the basic needs. 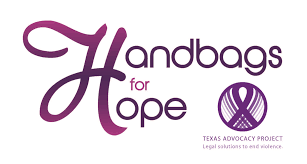 ¨ Purses for Domestic Violence Victims-In collaboration with the Texas Advocacy Project we collect purses which are then donated to victims of domestic violence. Each purse is outfitted with the telephone number where a victim can receive help if they suddenly flee with nothing but their bag. ¨ Books for Libraries-We help to collect book for young readers to expose them to the enriching experience of reading. ¨ Meal prep and service to Community Home-We prepare a full meal which we serve to the residents of a Community Home. Then we join them for some interaction and social time. ¨ Christmas Carols at Hospice-We raise our voices in song during the Holidays to raise the spirits of people living at a local hospice center. ¨ Planting Trees-This past year we participated in planting hundred of trees as part of Rotary’s commitment to reforestation. ¨ Laces of Love Shoe Distribution-Hill Country Ministries coordinates a massive event during which brand new shoes are distributed to school age children. We traditionally provide support with bilingual volunteers. ¨ Dignity Bags (2 x a year)-Same as above. The need is so great we do this twice a year. ¨ RYLA (Rotary Youth Leadership Academy)-Rotary is famous for it’s RYLA camps and the camp that is provided by our District is a winner! One full week long, participants surrender their smart phones and learn to maximize their potential as leaders. Our club provides support for the kitchen as one of our members is a Chef.